When I decided to start this blog a few months ago, for obvious reasons I made a conscious decision to keep it strictly socio-cultural, without touching upon sensitive geo-political issues that would likely obscure the very message I am attempting to convey. However, after the tragedy that occurred in Mina over the past month amidst a backdrop of an evermore tense and frankly frightening political climate, I feel there are some things that must be said and this blog provides the ideal venue. It’s not a very encouraging time for those who dream of peace in the region. Discourse and rhetoric on both flanks of the Saudi-Iranian ‘divide’ are becoming more scathing, and more pronounced. On the Iranian side, there is a perception among many that the Saudi government somehow targeted those of Iranian nationality (theirs bearing the brunt of the death toll) and failed to adequately manage the tragedy post-event. Many in Saudi Arabia conversely are convinced, and convincing others, that there was some high-level Iranian involvement to instigate the stampede and hence stir commotion and upheaval, putting into question Saudi Arabia’s authority over the holy sites. What is being side-lined in both cases is the very real, human aspect of the disaster – those that have lost their lives or lost loved ones on a spiritual journey that is meant to be the highlight of a devout Muslim’s life. The blame-game and heightened rhetoric tends to only exacerbate the pain of those grieving at this sensitive time. Yet another event is now polarising the two populations even further, to the delight of hardliners, while pushing the possibility of mutual understanding and empathy back another few decades. This disaster cannot and should not be belittled; however, it is also worth considering what is at stake on a larger scale for the future of the region and its inhabitants, and what needs to be kept in mind. I had left Iran immediately after the unfortunate events of 24 September for a conference. It was then that I was asked, or implored, by my mother not to return and risk my safety at this delicate juncture. She is under no illusions that the country is teeming with mobs sharing the sole aim of tracking down and attacking Saudis. Nonetheless, the images of anti-Saudi demonstrations outside the embassy in Tehran coupled with the sharpening tone of both governments towards each other gave her cause for concern. I calmly reassured her, as I have to other family members and friends enquiring about my safety, that as poignant as it is, and regardless of what the media shows (media which also regularly aggravates tensions), I truly don’t expect this latest event to fundamentally alter my experience or encounters in Iran. Nor has it since my return. I do concede, the immigration officer on my way back in inspected my passport for a few more seconds than usual, and proceeded to ask me questions with a rather stern face. Nonetheless, as soon as I got to my topic of research (Iranian Studies), his face broke into a wide smile as he acknowledged my objective interest in the country, and he wished me the best of luck while stamping my passport. 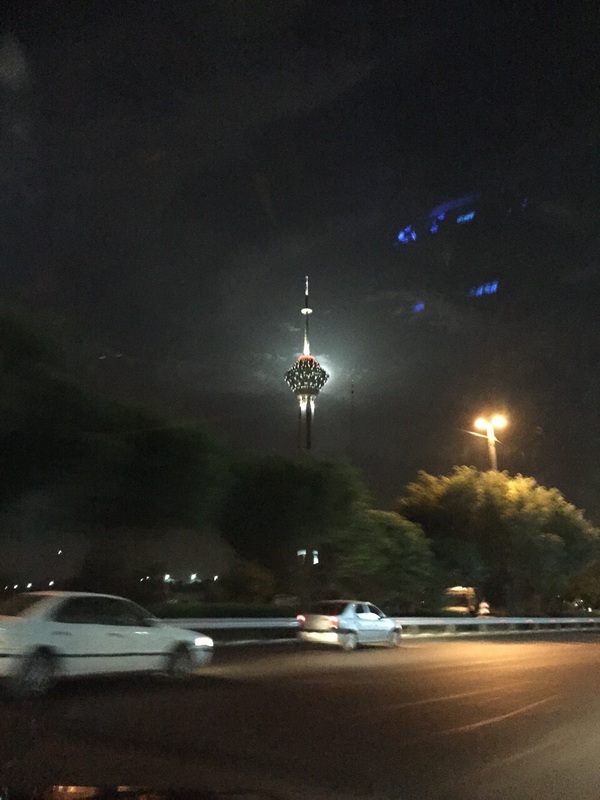 I have been living here for nine months now, and my experience with the wide majority of people that I meet – and you meet a lot in the hustle and bustle of Tehran and surrounding regions – is that people are able to separate between politics and individuals in a way that is in fact unique in the Middle East. Not one person I have come across has cared that I am Saudi Arabian; not one person I have come across has cared that I am Sunni. Of course, this is besides the gasps of interest followed by a series of questions. It’s not as though I am holding a huge placard declaring myself as Saudi; as I’ve mentioned in previous posts I blend in as many Arabs could pass for Iranians, and vice versa. As soon as someone hears the quirk in my accent though, after usually asking if I’m Indian (which I get the world over) and then finding out my nationality, the interest and curious questions begin. I am not claiming that hardliners or chauvinists do not exist. I am also not trying to claim that the experience of every other Saudi Arabian residing or visiting here might be the same as mine. All I can give however is my own personal feedback and what I have come to understand about the Iranian people; and with the relative scarcity of fellow Saudis here, I think it is a good example to go by – assuming that other hypothetical Saudis wouldn’t come here expressing prejudiced or extreme views themselves. One cannot generalise and blindly label a population of 80 million, just as one cannot do the same with a population of 19 million. I suppose there is another relevant example to mention in this regard. Yesterday, as I was buying some dough from the university shop (a yoghurt drink, laban or ‘ayran in the Arab world), a good friend of mine joked to the cashier: “don’t serve her, she’s Saudi”. While I personally knew that the mentality of my friend could not be further than what his joke indicated, after he left the cashier – a lovely lady that I enjoy a good rapport with – spent a full five minutes taking me aside to make sure I wasn’t offended, hurt or in any way upset by his comment. She said that remarks like that have no place here, no matter what the context or intention. The silent majority has nothing to do with the politics at the top. They are not looking for where to place the blame. They are mostly going about their day-to-day lives, some are currently mourning, and others are perhaps wondering when the region will ever get back from the depths it has plunged to – as I am. This blog has up until now been trying to recount my everyday experiences and display the kindness I have witnessed from both strangers and acquaintances as a Saudi Arabian here, not because I think that kindness and hospitality are unique to this country or something not to be expected in Iran, but because the damaging and divisive way in which so many interpret the current ‘cold conflict’ between our countries gives credence and authority to the preposterous idea that there is a fundamental enmity between the populations. I’ve been attempting to use my personal experience here – while of course not an all-inclusive, infallible sample but still something – to disprove just that. In my humble opinion, those of us with more moderate outlooks need to do much more to tackle the damaging words and stereotypes that are so lightly strewn about if we ever want to see a region that is not on fire. Some might argue that it has nothing to do with us, but on the contrary, it starts with the personal, the human conduct and interactions between those who are to inhabit this star-crossed region. There needs to be far more awareness in general and less susceptibility to blind hatred, prejudice and false categorisations. This of course goes for both sides of the ‘divide’. If we are ever to witness a day where animosity or destruction does not permeate the pores of the Middle East, extreme, sectarian or simply bigoted views and statements must be de-normalised and ostracised, and indeed one day hopefully removed from the equation. A day when radical preachers, for instance those pronouncing fatwas that the blood of all Shia ‘heretics’ or their sympathisers is halal, will themselves be outcast. Both populations – to be sure, all of us in the Middle East – need to be more aware of the middle ground, which surely exists among us but is not as vocal as the others. If we wait for the politics of the region to first settle, it will undoubtedly be too late. Open minds, compassion and awareness of the other is what we need to start moving forward. Sorry for the rant. I will henceforth return as much as possible to the socio-cultural. I arrived back to Tehran about a week ago. My flight landed in the evening, and after going through immigration (spotting twice as many foreigners as the last time I was there) and picking up my luggage, I met with the driver who was waiting for me. As we stood descending in the elevator, which was playing a tinny version of Unchained Melody, down to the parking garage, I felt a distinct surrealness. Thinking of my family, friends and elderly dog that I had just left, all the familiar questions of self-doubt and uncertainty that I had experienced upon my first arrival in Iran started popping seamlessly in my head. After hitting the road, the taxi driver struck up a conversation, and I gingerly responded to his questions with my out-of-practice Farsi. All of a sudden, a car sped up to us from behind until we were side by side, and the woman in the driver’s seat rolled down her window and urged my taxi driver to do the same. With both cars going about 120 kmph on the highway, she asked for the way to Imam Khomeini’s mausoleum. While the driver shouted back the directions, I couldn’t help but smile as I started to sense an indescribable feeling of being right back at home. Upon reaching my dusty flat, I unloaded my luggage and went straight to see my neighbours who I had truly missed. They gave me a wholehearted welcome, and the lady of the house, Shohreh – although she was clearly about to go to bed before I arrived – insisted on making me dinner. This was something she had offered on a regular basis before I left for summer, but I would always politely decline. This time however, I was far too exhausted and frankly hungry to turn down her kind offer. It seems I’d opened the floodgates, as ever since I’ve had dinner brought over to me almost every night – all ready on a plate with adjacent vegetables, so too late to refuse. I’m completely overcome by their thoughtfulness and constantly trying to think of nice things to do for my neighbours, especially since my typical dinners (which many a time consist of packaged miso soup and crisps) can’t even be placed in the same category as Shohreh’s exceptional cooking. Over the following week, I quickly got back into the swing of things. I’ve happily found that my muscle memory still recalls what it takes to navigate my way across the tumultuous roads. These had once prompted my mother to ask in exasperation upon her visit, “do you cross these roads every day?” I had replied in all seriousness, “only on the days I go out”. Within the first week I also had the somewhat customary profound, existential conversation with a taxi driver, so all was par for the course. My classes had already started, and after a little reunion with my classmates I was also happy to find only one 8am start on the schedule this term. Though the Farsi classes have yet to be scheduled – so fingers crossed. I’ve also been catching up with all the people at my local corner shop, dry cleaners, fruit vendor, bread bakery and flower shop. After not seeing me for three months, the staff at these places genuinely greeted me more emphatically than some of my casual friends would back home. The young Kurdish boy who works at my corner shop even peeled his eyes away from the television screen, which was displaying a Barcelona-Roma match (he is a huge Barcelona fan), to ask me about my travels. The more of these encounters I had, the more I realised I really was experiencing the basic human connections I was seeking that had partly motivated my decision to come here. I ended my week with something most definitely outside of my normal routine. A friend of mine had invited me to go see a Jean-Paul Sartre play at the Farhangsara-ye Niavaran, a cultural centre in North Tehran. An Iranian cast was performing ‘The Unburied Dead’ (Les Morts Sans Sépulture), or Mordegane bi Kafno Dafn in Farsi. While my friend was afterwards slightly critical of the acting, as we sometimes tend to be with products of our own culture, I was taken aback by the excellent Farsi-language portrayal of the philosophical themes involved in the story about a group of dissidents captured and tortured by German soldiers during World War II. It was my first time watching a Sartre play, and can honestly say I never thought I would be doing this in Iran. That being said, I did see a Farsi production of Death of a Salesman during my first term at Tehran’s national theatre, before ever having seen it in English. With my minimal language skills at the time, it’s safe to say my confusion over the plot line was insurmountable. As my weekend begins, some friends and I are gearing up for an overnight bus trip to the historic city of Tabriz in northwest Iran, where we plan to spend a few sight-seeing days. More to come soon. On one of my final days in Tehran before the holidays, a friend of mine invited me to a dinner with some of his colleagues at the Azari Restaurant. This is a hundred-year old, restored traditional Iranian tea house or ghahve-khane in South Tehran that hosts live music bands and was established during the time of Reza Shah Pahlavi. As I arrived and located my party, I took off my shoes to climb into the large, carpeted divan characteristic of traditional restaurants here and greeted the fellow guests before sitting down. I started to get acquainted with my neighbour for the night, a prominent Malaysian scholar at the National University of Singapore, who was married to an Iranian woman and visiting Iran for a couple of weeks with his family. We engaged in a very interesting conversation about the Middle East and his field of study, which partly involves Islam and the Sunni-Shia conflict. According to him, there needs to be much more focus on the fundamentals of this matter, in order to raise awareness about the lack of basis for extreme views on either side which have partly led to the violence and destruction plaguing the Middle East. This resonated strongly with me, as in my opinion it’s this same absence of awareness that has led to tensions between some Arab and Persian populations, an issue intertwined with the Sunni-Shia one. As we continued our chat, the band started preparing their live set and my eyes fell upon our host. My friend, Hamid-Reza, is the epitome of Middle Eastern hospitality; he spent the entire night rushing between our table and the reception, coordinating all of our orders and making sure everyone had what they needed before even thinking of sitting down and touching his food. He relaxed at long last, just as the live music began with a range of captivating Iranian instruments, the names of which I still only know a shameful few. After the first song came to an end, one of the band members asked the restaurant patrons where they were from. Several tables began shouting out their regions or cities: Mazandaran (northern Iran); Kurdistan (north-Western Iran); Khuzestan (southern Iran); Khorasan (central Iran), and so forth. The band then proceeded to play traditional songs from all of the mentioned regions, to the enthused clapping and singing along of the diners. Taking in the cheerful atmosphere and listening to the sounds of the chords and drums, I looked around at the paintings hung on the walls. One depicted a scene from an old traditional tea-house with men gathered around smoking water pipes, or ghalyoun in Farsi. Another showed a fierce battle between the esteemed hero Rostam and one of his arch-nemeses, the Div-e-Sepid or White Demon, from ‘The Seven Labours of Rostam’ in Firdowsi’s epic poem the Shahname. In that moment, with the enthralling music playing in the background, I genuinely felt as though I was in a land frozen in time, or an orientalist’s dream. I must admit, before coming to Iran myself, I was guilty of mysticising the country. Back in London, I would ask every Iranian I met just what it was like, as if it was some imagined, far-off planet. Not until I moved here did I really appreciate the fact that while there are indeed countless magical elements to it, Iran was just another country with people going about their normal lives every day. I think that the inability to truly visualise that reality, or relate to the country and its people, is what leads many in the region and elsewhere to oversimplified or misguided views – being caught between negative media portrayals and other-worldly imaginings. It’s something that I personally didn’t fully comprehend before spending time in Iran, coming to realise that at the heart of it the everyday lives, concerns and desires of people here are not much different to what they are anywhere else. It’s the combination of the magical and the commonplace that I’ve found here, however, for instance while walking through the remains of Persepolis or witnessing the simple kindness of strangers, that has truly endeared me to the country. With exams and essays done and dusted, and my packing at various stages of completion, everything is pretty much ready for my departure from Tehran tonight. I’ve had my little farewell-for-now party; I’ve said goodbye to my fruit and veg vendours and those at my local corner shop and dry cleaners; and the next three Farsi Harry Potter books have been purchased and packed, to support my language progress in its inevitable summer decline. I’ve grown quite fond of Harry, Ron and Hermione’s Iranian alter-egos. What I will really miss and can’t exactly bid farewell to is the city and country itself: the charm and joviality of its people; the view of its majestic mountains unceasingly watching over the capital from the north; and the constant prospect of adventure and travel just around the corner. Nonetheless, I am excited to see my family and friends for the next three months, and am already looking forward to returning to a more mildly-weathered, potentially sanctions-lifted Iran. When there’s a public holiday and a simultaneous long weekend in Iran, the thing to do is travel. Some will go back to their home cities to visit family, while others will travel around various regions for tourism and leisure. More recently it’s become significantly harder for lower income families to meet the travel expenses for every holiday, but it’s still a generally widespread practice among Iranians. Unless you’re going back home, the choice of destination will usually depend on the time of year. The northern region of Iran is the most popular for the spring and summer months. With a long weekend upon us, a couple of friends and I decided we’d like to jump on the bandwagon and also get out of town for a few days. The weather in Tehran has been stiflingly hot, and we figured a change of scenery might also jumpstart us into much-needed study mode. I myself haven’t been able to shake the feeling that my summer holidays have already started since classes came to an end, even though exams are right around the corner – starting with Farsi tomorrow. We decided to go to Ramsar, a highly-acclaimed city in north Iran known for its natural beauty, where a friend helped us arrange a villa. The only problem with the fact that everyone travels for long weekends in Iran, however, is that everyone travels for long weekends in Iran. In the run-up to our trip, we’d been hearing horror stories from all sides about the unspeakable traffic queues to be expected on the road to Shumal (northern Iran). Our journey, which should typically take some four hours by car, was projected by some to take up to 14. We were even advised not to go on several occasions, especially after one of the four roads leading north was closed by traffic police. Not to be discouraged, in typical foreigner fashion we planned to beat the system, staying up on Wednesday night to hit the road at 4am in the belief that we’d be among the few who had thought to travel at such a late/early hour. How wrong we were. Even before hitting the first wall of traffic, our taxi driver conceded that we had probably picked the best time considering we had to wait until one of our friends’ work day ended; nonetheless, he had no doubt we would get gridlocked. In fact, he mentioned that although his wife has over countless years suggesting going north for long weekends, he never once agreed because of the prohibitive traffic. I apologised that we had now caused him to potentially face this nightmare, moreover with us as his company rather than his family. Upon leaving Tehran, the traffic began to thicken, going through sporadic starts and stops. Since it was a novelty for me and I was adrenaline-pumped as I usually am when staying up, it was actually a fascinating scene to be a part of: it felt like we were in a thousands-strong convoy all heading to a common destination, like a festival. Looking at the vehicles around us, some loaded to the hilt with luggage on the roof, there was a variety of different moods within them. Some housed families that were all fast asleep save the unfortunate driver of the car; others had passengers that were laughing and dancing, starting their weekend celebrations on the road; others still held silent, livid-looking bunches observing the traffic ahead. There were also cross-city buses sharing the road filled with forward-thinking passengers – this was our first choice of travel before realising all the buses to Ramsar were fully booked weeks in advance. At periodic intervals, some had stopped to erect their tents on the side of the road and have picnics. Elderly men were walking around in their hiking gear (the north is famous for its stunning hiking trails), while groups of friends took selfies in front of valley rivers and other spectacular landscapes. Restaurants, corner shops and street food vendors dotted the way and remained open at all hours to supply weary travellers on the road, livening the atmosphere and adding to the sense of our joint migration. Street merchants circled the cars with flowers and CDs, while others were waving around the lovely Iranian incense known as Esfand, or wild rue. Though I was sure that those who regularly endure this must find it extremely tiring and tedious, I was enjoying the surrounding atmosphere. By the time the worst of the traffic subsided and dawn had fully broken, my friends had fallen asleep leaving just the taxi driver and I – and what honestly seemed to be the rest of Tehran’s population behind and ahead of us – to wind through the magnificent mountains ringing the road north. This gave me ample time to think and, with the holidays fast approaching, reflect on my time here so far and whether I’ve at least partly achieved what I set out to. The main question on my mind was whether jumping into the unknown has been worth leaving a steady and rewarding job, worrying my mother that I was one step further from settling down and providing her with children to play with, and potentially placing me on several watch-lists on my side of the region. I came here wanting to immerse myself in the local culture, learn the language and gain a deeper understanding of the people here, hopefully taking some of that back with me to confront some of the stereotypes. I began evaluating my progress in those fields. While my exam tomorrow will probably give a more accurate assessment, I’m quite happy with my level of Farsi. Due to the close proximity between Arabic and Farsi and the intensive nature of the language course I’m enrolled in, when I now come to speak Arabic with family, friends or Arabs I’ve met in Iran, I actually sometimes find myself mixing Farsi words into my speech. Moreover, at times I subconsciously express the Farsi pronunciation for words with identical spellings but different pronunciations in the two languages. It seems I’ve created a very special brand of ‘Farabic’, and have definitely noticed a couple of curious stares from native Arabic speakers when it happens. Nevertheless, I will hopefully work out these little quirks in time. Furthermore, during my time here I’ve met and befriended some truly wonderful people. This was highlighted by a gathering I had for my birthday a week ago, where I realised I was going to really miss my friends throughout the summer holidays. A couple had made me a beautiful scrap-book containing pictures of our many travels around Iran, reminding me of all our adventures and filling me with anticipation to continue these upon our return. Based upon others that I’ve been to here, my gathering was unique in that it hosted Iranians from widely different social backgrounds, but all united in their good nature and kind-heartedness. On that note, after hearing from her daughter Donya, who has become a good friend of mine, that I planned to have people over, my neighbour insisted on making me a variety of mouth-watering dishes. Considering my sorry cooking skills – the improving of which was another goal of moving here and living alone, still in progress – her kind offer along with the help of friends who came early thankfully enabled me to feed my guests very well, while constantly correcting compliments on ‘my’ wonderful cooking. As for the aim of taking back a more accurate view of this country and its people, while I’m quite certain I’m not changing the world I very much hope that this blog, as well as my numerous conversations and fielding of questions from people back home, is going a short way towards achieving this goal. I’m very aware of the unique opportunity I have with my experience in Iran, and am anxious not to waste it when there are so many people in the region with the wrong idea. It’s quite a strange feeling knowing I’ll be leaving for three months. I feel like I’ve been in somewhat of a bubble here – granted, one I’ve thoroughly enjoyed – and am eager to see what it will be like to return after the summer sojourn. I very much hope my Farsi will hold up, and plan to seek out as many Iranians as possible to practice during the holiday, as well as keep up with my Farsi Harry Potter series (I’ve now reached Harry Potter o Zendaniye Azkaban). Taking it back to the road just as the sight of the gloriously green mountains and splendid nature jerked me out of my thoughts, the north was absolutely beautiful (pictured). We ate delicious food (with the proximity to the Caspian Sea, a northern specialty is fish – my favourite), rode a cable car to a mountain peak where we could view the exquisite coastal city below, and had a spontaneous (and in retrospect quite perilous) mini-hike where we scrambled up a steep mountain hill, a couple of us wearing sandals. Although I would probably not willingly choose to spend all that time in traffic again and sooner kidnap my working friends to leave before the official start of a long weekend, I definitely plan to go back and explore further cities along the Caspian coast. Unfortunately not much studying was done, but I comforted myself with the knowledge that I spent the whole weekend speaking with locals in Farsi and will therefore be fine for my first exam. While I self-answered my abovementioned travel contemplations about coming to Iran with ringing positivity, I guess we’ll find out the answer to this one tomorrow. Last weekend, my friend Alice suggested that we go visit Zendan-e Ghasr, or ‘Palace Prison’. One of the oldest prisons in Iran (pictured), it was built in 1790 during the Qajar era in the form of a palace, hence its name, by a Russian architect named Nikolai Markov. In 2008, the prison was permanently shut down and turned into a museum for the public. Walking through the beautiful gardens, we found ourselves at one of the museum entrances, where we were helped by a security guard who encouraged us to join one of the tours that were about to start. We happily obliged and were subsequently linked with a group to be shown around the general prison halls and cells, some of which housed recreations of their former inmates in various forms. Sombre music accompanied a few of the long halls, creating a poignant and somewhat eerie feel. One of the most touching aspects of the museum was a room where old videos were been played showing former political prisoners being reunited with their families and loved ones on January 16, 1979 – the day the Shah left the country post-revolution. Following the general prison tour, we were dropped off at the political prison across the courtyard and received by a solemn man seemingly in his seventies or early eighties. A small man in a crisp suit with a stern, heavily-lined face, our guide gave the impression that he had walked those halls hundreds of times. He proceeded to show us around the political prison, giving us (from what I understood) in-depth, detailed snippets about what prison life was like in its heyday. For instance, according to him, the inmates had devised their own system by which all food packages brought by their visitors would be shared among all. As a large number of the political prison population came from very distant regions across Iran, years could go by without them receiving any family or friends as visitors. Therefore, this system was intended to spare their feelings and forge a more equal atmosphere of solidarity. The visiting room itself was a fascinating feature. It consisted of a moderately-sized, partitioned hall which prisoners and visitors had to shout across to communicate with each other. According to our guide, and verified by the very loud tapes being played overhead re-constructing the conditions, it was utter mayhem. Towards the end of the tour, our austere but occasionally smiling guide informed us with a barely perceptible flicker in his eye that he himself had been incarcerated for four and a half years in the political prison for speaking and writing against the regime of the Shah, roughly six years prior to the 1979 revolution. He then pointed out his very own mug-shot photo among the dozens plastered to the wall near the exit. We stepped outside the dark, concrete prison to a radically different atmosphere. There was an exhibition and fair going on that week, and after wandering the street markets set up in the large museum courtyards and eating some falafel, Alice and I sat down to watch a demonstration of Kurdish and Khorasani (central Iranian) dancing on the stage. We then left the museum complex and realised that even a short prison stay had taken it out of us, so decided to go somewhere a bit more cheery. Parchak Cheese House in Abbasabad provided the perfect alternative. After some walking, getting lost and caught up in what seemed to be a brewing sandstorm, we decided to get a couple of shared taxis to reach our destination. Shared taxis are one of the most common forms of transport in big cities here. They offer extremely low rates for relatively long distances; many are just average people looking to make some extra money during tough financial straits. For me, shared taxis provide a particular advantage in the form of Farsi practice. It’s quite commonplace for the drivers and passengers to strike up a conversation about politics, social issues, a nearby manic motorbike driver, and so forth. So sometimes just a short ride can have both my practice and my current affairs on the street sorted. Back to the present. After witnessing a minor scuffle over territory rights between another taxi driver and the one whose car we had just entered – apparently our driver was on the other’s turf, but we completely sided with our guy, a jovial old man – we headed up Vali Asr, the Middle East’s longest street (17.9km). We alighted at the Cheese House and entered the comfortable, aesthetically-pleasing setting. Another friend joined us and we sat down to unwind with some lovely cheese, saffron tea and soft music in the background, as I grilled my friend about when I could acquire the leaked Game of Thrones episodes from him. When we came to leave, however, I discovered that my wallet was nowhere to be found. Having gone through the customary panic and periodic bag-search, I realised that I must have either left it in the taxi or dropped it on the street as I stepped out. We had been dropped off by the taxi at a relatively early hour (around 8pm), leaving plenty of time for other passengers to be picked up after us – and while I wanted to stay optimistic, most of my friends as well as the police who I later called informed me that it was most probably gone. I knew it wasn’t the end of the world, but was still quite distressed as my wallet contained some important items such as my British driving license, my Saudi ID card, my University of Tehran student card (which can only be replaced once), as well as a large sum of Iranian toumans – considerably more than I would usually carry on me as I had just exchanged some pounds. There was a silver lining though: friends of mine as well as the police told me that while most times the money and actual wallet are taken, the documents may be placed in a post box to be eventually reunited with their owner. This did give me some fragile hope, but it still left me in a jam money-wise. I spent that night and the next dreading the transnational bureaucratic labyrinth I would likely have to manoeuvre to start getting my documents back, as well as figuring out how to deal with my financial situation for the next couple of weeks before leaving Iran for summer holidays. A friend had lent me money so I was set for the coming few days, but the constant mental replay of my momentary yet silly mistake, which had placed me in quite a thorny position, was getting me down. Nonetheless, while at university on Saturday (the first day of the week here), I received a call from a sweet-voiced woman, asking me if I had lost a wallet, and didn’t I want to get it back? I couldn’t stop myself from jumping up and down, ignoring the stares I was getting, and tried to calm myself enough to speak to the woman. She was the wife of the taxi driver, and as it happened, they had been trying to get through to me since they had come across the wallet. First, they had called my university, which couldn’t give out students’ personal information no matter the circumstances. Next, they had gone to my bank to obtain my phone number; unfortunately, the number they had on record was evidently wrong, as I had registered in my first week in Iran and was still getting confused between 4 and 6 (the only two numbers written differently in Farsi than in Arabic script). Finally, they had found a doctor’s note in my wallet from a recent visit, and after calling the doctor’s office and explaining the situation, she thankfully gave them my correct number. Upon hearing all of this, I was truly taken aback and overjoyed by the effort these strangers had gone to in order to find me as soon as possible. We arranged to meet at the appropriately-named Seyyed Khandan locality (‘seyyed’ is a noble title, and ‘khandan’ means laughing or smiling – the area is named after an Iranian religious scholar); a friend of mine kindly drove me there. I quickly located the cheery-faced taxi driver who was waving my wallet outside the window and hurtled myself out of the car to go meet him. My friend and I then profusely thanked him, to which he calmly replied that he had done nothing more than the right thing, and that no thanks were required. It took me quite some time to convince him to accept the box of pastries I had got for them, as he kept insisting they weren’t deserved. I begged to differ, and tried to express in Farsi how moved I was that they had gone out of their way to locate me, on top of the fact that he had been waiting for me by the side of the road for almost an hour at peak traffic (meaning highest earning) times. ‘Faith in humanity restored’ is a phrase I will definitely have to learn in, or possibly import into, Farsi. This is, by far, the question that my khareji (foreign) friends and I get asked the most here by Iranians. It comes, I think, not from a lack of pride in or love for their country, but rather out of simple curiosity as to why it was chosen out of all others – and moreover, what we think of it now that we’re here. The interest is more acute the further away from Tehran you get, especially in more remote regions. Given the overwhelmingly negative media attention Iran receives from most other countries, as well as the relative decrease in tourism since the revolution, this is hardly surprising. I actually sometimes ask myself the same question (usually when waking up for my 8am class or during exam times). It never takes me long to find my reason again though. Apart from the in-country travel opportunities, the unique experience and of course the culinary features, needless to say what makes a country is its people. Having had several Iranian friends in London, I already knew that friendliness and generosity featured highly among them, which encouraged me to go to the source and learn more about this culture. To state the obvious, you meet all kinds of people in Iran just like anywhere else. But I find a great way to observe and understand societies to be during the most mundane of tasks. The daily commute and inner city travel provide perfect opportunities for this. I’d therefore like to use these as an analogy for my hitherto impressions of Iranian society. One of the things that strikes me the most, pretty much since my first week in Tehran, is how frequently people ask each other for directions. Pedestrians asking fellow pedestrians, drivers of moving cars rolling their windows down to ask an adjacent car, and so forth. This isn’t too significant in and of itself (Tehran is an enormous city), but what I find most interesting is the attention and care with which people respond. The majority of my experience has shown me that people are perfectly happy to stop whatever they are doing and provide the most thorough directions possible, indeed giving the impression that they find it valuable to help others as much as they can. I’ve also come across situations where, after one was unable to get proper directions from someone else (yes, I was the ‘someone else’ in most cases), another person would overhear what’s going on, join in and offer their help. Regularly being the enquirer myself, I’ve even been escorted to my point B many a time, when it’s within walking distance. Compared to a city like London for example, where although most of the time you’ll get the help you need but feel acutely aware that you’re wasting precious time out of somebody else’s day, I find this attitude and communal spirit really remarkable. It’s an outlook I’ve rarely seen in other places, and in my opinion is something that really adds to the charm of the country. Another example of this shared compassion can be found on the Tehran bus route. While it can sometimes be a struggle getting on the bus, especially at peak times, small acts of kindness ensue after everyone is safely inside. Other than the customary offering of seats to the elderly, for instance, if a standing passenger is carrying seemingly heavy wares, often times someone else who’s managed to find a seat will offer and insist on holding the baggage on their lap. I’ve repeatedly had this encounter when I myself have a heavy load and am working hard not to sway as the bus navigates the Tehran traffic. While some might view this to be unexceptional, I myself have never seen such forward kindness and consideration between absolute strangers and find it truly endearing. Moving on to the metro. When I’m alone, I don’t usually get curious looks or questions and am thought to be local. When I’m with foreign friends, however – especially when it’s just a couple of us – on many occasions I’m assumed to be their translator, and people proceed to ask me questions about them (where are they from; what are they doing here, etc.). In my first few months, I remember quietly chuckling at others’ horrified faces after hearing my level of Farsi and before realising that these poor foreigners thankfully don’t have to rely on my translating services. Nonetheless, it’s not only foreigners that get approached or contacted on the metro. The aforementioned communal spirit extends underground, as total strangers engage in conversation about any topic under the sun, sometimes prompted by a simple question or a random comment. To compare with London again, it’s the polar opposite of the perennial effort to avoid meeting each others’ eyes on the tube. Of course, even here, many tired commuters look like they would sooner jump off than have to engage in conversation. In my experience though and in line with the great emphasis on hospitality in Iranian culture, they would happily oblige if approached. Even though I’m sometimes so exhausted after a long day that I may fit into the jumper category, this is an aspect I genuinely admire about the culture here. The lack of boundaries can be intimidating to those accustomed to the sharp delineation of personal space (it took some getting used to for me to be perfectly frank), however at the core of this behaviour I find a very comforting, encouraging sense of camaraderie and communality. When I was back in London and first came up with the idea, I made my decision to move to Iran relatively quickly considering the change it entailed. In my first couple of weeks here, faced with the teeming metropolis that is Tehran, the language barrier and lifestyle adjustment, and the feeling of isolation that came with my first time alone in a country where I basically knew no one, I must admit I second-guessed my decision on several occasions. Even before I started making friends, however, the kindness with which others welcomed me, and furthermore just observing the compassion and goodwill with which many ordinary Iranians treated each other, ensured me that I would soon feel at home and come to cherish this place. When people here ask me what I think of their country, it’s very hard to express all of this. But my favourite aspect, and what has truly made my experience so far, is the people. It took me quite a while to finally decide to start this blog. I never saw myself as a blogger, or someone who’d have interesting enough things to say to constantly update a blog. This viewpoint remained even after I moved to a country that is quite literally at the centre of global attention nowadays, while still being shrouded in mystery for many. However after being here for the better part of a year, I decided that it might be time to face my fear of the blogosphere (mainly that I would let the blog shrivel and die before the eyes of the world.. Alright, probably not the whole world) and start sharing my experiences. Last night a friend of mine in Saudi helped me reach this conclusion (thank you Lama) by telling me that I’ve probably just become too used to life here to realise that while I may no longer find novelty in my experiences, what I have to say may still be interesting to those on the outside who have no idea what it’s like on the inside. So last night, adrenaline pumping, I decided to get to work… Only to find my internet was down. After having slept on it and woken up even more resolute in my decision, then sitting through seven hours of class eagerly anticipating a post-class session in a coffee shop with high-speed internet access, I stepped out of my campus in southern Tehran only to find a heavy thunderstorm commencing after a beautifully sunny day. A friend of mine kindly offered her dorm room right across the road for me to write in, where I am currently sat. I realise I may have bored any readers out there already, but this long tale of not-so-trying trials and tribulations is my way of saying I’m very happy to finally be doing this. It all started last year, when I was residing in London and working at LSE’s Middle East Centre. I had always had a modest interest in Iran, having studied some Iranian history and completed an elementary course in Farsi at SOAS, University of London. The more I would hear about this country from the news, friends or in my work, however, the more my interest was piqued. It is no secret that negative stereotypes abound from within the Arab world towards Iran (and vice versa). While I never lent any credence to these, such unfounded opinions only enhanced my desire to actually set foot in the country, see what I found and perhaps even work towards dispelling some of those misconceptions in my part of the world. Going on my eighth month in Tehran, I’m confident that moving here was the best decision of my life so far. Before leaving to Iran in September 2014, I was warned by many to be wary of people’s reactions to me as a Saudi national given the state and history of the two countries’ relations. My mother was the most vocal in this respect; while harbouring no bias towards the country or its people in the slightest, she was just being a mother, indeed one that is aware of current affairs and rising tensions in the ever-turbulent Middle East. Nonetheless, during my time here so far I can confidently say that I have experienced neither bigoted statements nor any kind of negative reaction whatsoever. What I have found instead is kind hospitality, from my colleagues at the University of Tehran, to taxi drivers, to passersby on the street who mistake me for an Iranian while asking for directions (you don’t want to be getting those from me). In the place of the judgmental or scathing remarks which many feared, there is only boundless, good-natured curiosity, as I am usually the first Saudi Arabian that many meet, save those who have travelled there for pilgrimage. To be sure, the only other Saudis I’ve come into contact here are those at the embassy. I truly hope this will change, as my time here has shown me just how much the country has to offer, from magnificent nature to a spirited population – not to mention, of course, the food. Travelling around Iran and marking off my map is one of my favourite things to do in between (and sometimes – sorry UofT – in place of) university days. Every new city or region I see only makes me more eager to go onto the next, as the natural landscapes and sheer cultural variation between regions in Iran gives you the feeling of visiting several countries in one. I know that many from my region may not understand my decision or my point of view towards this country. Tensions between Iran and most GCC states have never been so high, at least not in my lifetime. Nevertheless, I don’t believe that reason enough to harpoon potential socio-cultural relations between entire populations, or add oil to the fire. I came here wanting to learn the truth about a country that many still see as a no-go zone. My Saudi nationality egged me on even more, in my hope and belief that the good nature of people should and will always trump politics. I’ve been in no way disappointed. I believe that’s enough rambling for my first post. This also happens to be the night before a university-organised trip to Shiraz and Kish Island, so – anticipating less than ideal internet connectivity – hopefully I will be back soon with some good material. As mentioned profusely at the start, I am a newbie to this scene and relatively hopeless with technology in general, so please bear with me. Also, if any readers have suggestions about a particular aspect they would like to hear about Iran, please do mention it in the comment section and I will endeavour to serve, to the best of my knowledge.